Well, this is one of the last “Essen” games that I’m going to write up – and the delay isn’t for lack of interest…. This has been one of the most intriguing games that I’ve played in quite awhile – mostly because I haven’t really played anything quite like this in the past. This “review” will have a number of firsts for me: it is probably the first review I have ever written that I haven’t actually ever read the rules for, and it is probably the first review in a very long time that I won’t write a detailed description of how to play the game. But why? Well, that’s also hard to write about without spoiling the game. 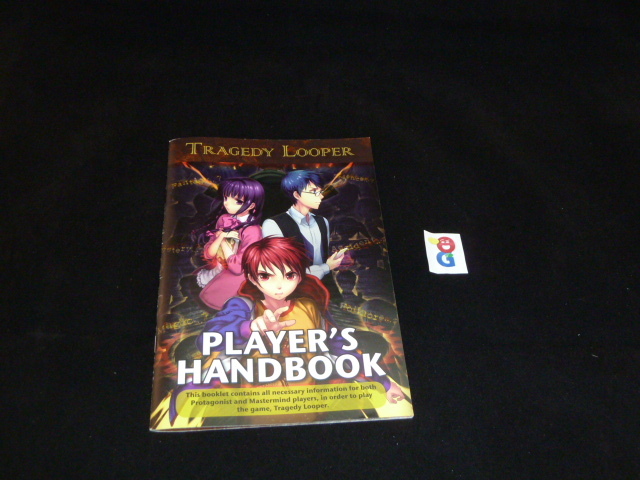 Essentially, the magic in Tragedy Looper is in the discovery process of the game itself. Let me try to figure out what I can tell you about it that doesn’t spoil the game. To start, it’s an all-against-one game. There is an (evil) Mastermind who plays against all the other players, known as the Protagonists. The Protagonists pretty much in the dark when they start the game. They are completely reliant on the Mastermind to show they how to play the game and what they can do. Heck, the Protagonists don’t even really know how they can win or lose at the start of the game. The game is set up, they learn what they might be able to do with the pieces and then they play. Let me describe the components a bit as well. 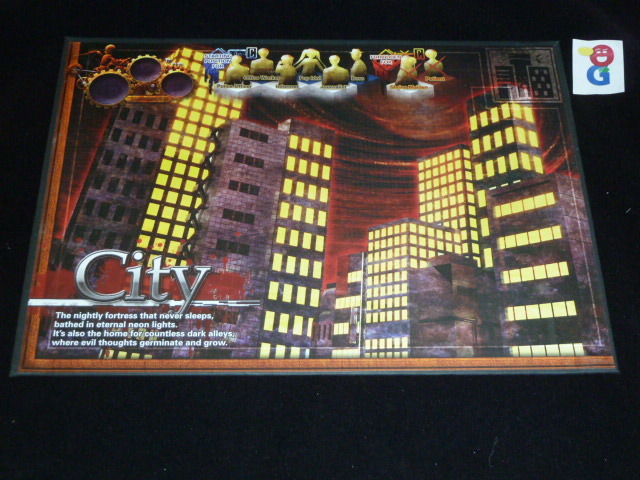 The game is played out on a board which includes 4 main locations: Hospital, Shrine, City, School. There are a whole bunch of character that can be placed in these locations. There are a bunch of counters that can be added to the cards as well. 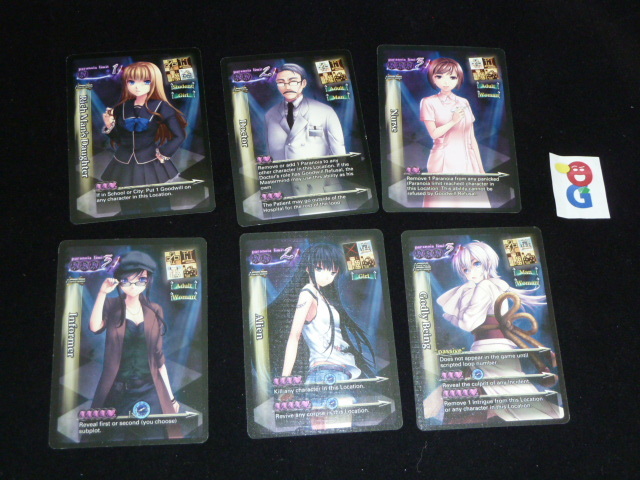 There are also decks of action cards which can be used to move or modify these character cards. On a turn, the Mastermind first plays three cards face down. 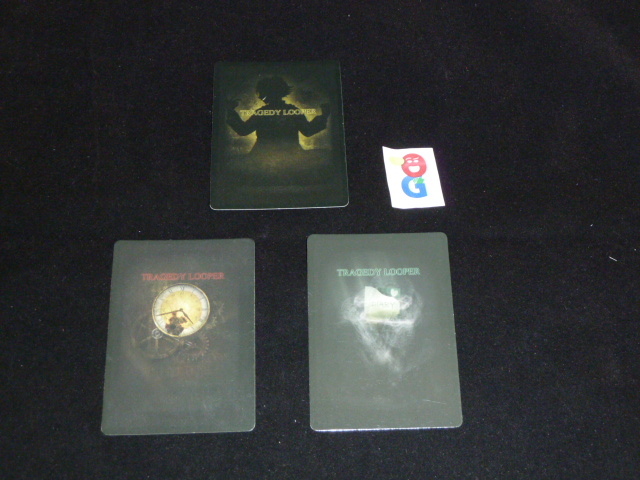 The Protagonists then get to discuss and place their own set of three action cards – which may be on the same or different places at the Mastermind’s. Since everything is facedown, you have to try to read the Mastermind’s mind – is he playing a card on the school girl because he wants to move them somewhere or perhaps make them paranoid? Well, I have action cards that would negate each of those actions, but which one is he trying to do? In the end, all I know is that something is going to happen to that character because a card has been played there. As the game unfolds, the Mastermind might eventually tell them that they’ve won (though this is unlikely!) or that their team has lost. This is where the looping goes into play. Before the board is reset, the Protagonists are given a few seconds to look at the board and try to learn from their losing situation. Then, if there are still loops left to be run, the game is reset and play restarts until either the Protagonists win or lose. Hopefully, this time around, the Protagonists have learned something about how the game went in a previous loop, and they can therefore try to learn new information (or at least try to avoid whatever situation they thought caused them to lose in the previous loop). The Mastermind wins under one condition – that the Protagonists run out of loops AND after the final loop, they are still unable to guess the win condition(s). Does that make any sense? I hope it at least sketches out the game, because as I told you earlier, saying anything more would spoil your discovery… Which leads to the downside to the game for me… This is definitely the sort of game that you want someone to teach you. If you get the game yourself and have to learn it as a group, you’ll likely have to do what our group did and nominate someone to become the initial Mastermind. That player will have to take the game home, read all the bits, learn how to be the Mastermind, and in this process, will spoil the first scenarios for himself. If you have someone around who has already played through the first scenario or two, that player can be the Mastermind and take your group though the initial scenarios, and you can all experience the game together at the same pace. Like many of these deduction games, each scenario can really only be played once. Because once you know how the story ends, there’s nothing left in the game for you. Because of this, our group tried to play scenarios together. However, we got off track somewhere, and the next time we play, we’re just going to have to dig deeper into the scenario book to find one that none of us have played. Sadly, I thought that I might forget the details of the first scenario that I played back at Essen-time, but I found that I still remember enough now to spoil the playing of that scenario again. To counter that, there is apparently a very large section in the Mastermind book on how to create your own scenarios – so that you will never run out of ways to play the game! There are a number of these “Custom Scripts” uploaded onto the Internet already, and I have been told by a number of friends that I know that it’s pretty easy to generate a Script on your own – there is at least one group I know that tries to have each gamer come with a script of their own, and then over that gaming session (or possibly 2), they each take turns being the Mastermind and running though their own scenario. So, I know that I’ve not really told you much about the game other than the barest of outlines. But I can tell you that I’ve absolutely loved the exploration of the game. I haven’t even wanted to move to the Mastermind side of the board yet – I have been having a blast playing as a Protagonist. I’m sure that I’ll eventually take my turn as I teach other players how to play the game. Larry (1 play): It’s clever and trying to figure out what’s going on, when you begin with next to no information, is fun at first. But once you make some correct deductions, the game devolves into a guessing game between the Mastermind and the players about what cards he played. And that just doesn’t interest me. But I can see why the early reviews have been so positive. Wei-Hwa (9 plays): I’ve now played the 1st scenario 6 times as the Mastermind, teaching new groups the game. 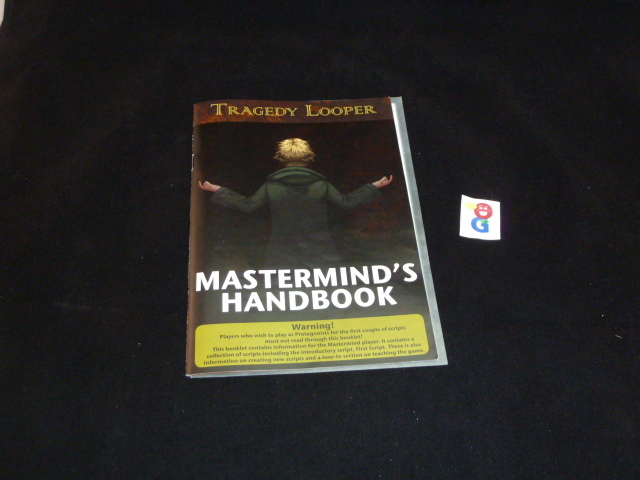 Being Mastermind for the first game is not as horrible as Dale makes it out to me; it’s pretty easy to avoid reading about the other scenarios, and the instruction booklet has a very good step-by-step walkthrough for the Mastermind player to follow for the first scenario. If you first game as the Mastermind is not for the first scenario, though, you’d better know the game well. As you can tell from the other Opinionated Gamers, the game starts out being a deduction game, but as you make more deductions, it evolves into psychological jiujitsu. Once the players make all the deductions, the game becomes nearly impossible to win for the Mastermind, so being a good Mastermind player is all about managing to get to your victory conditions while not giving up too much information to the players — in other words, if you get to the point where the game isn’t fun for Larry, it means the Mastermind hasn’t been playing well! The ironic thing is that as a Mastermind, I am now much more likely to lose the first scenario when I teach it because I’m much better at teaching the Protagonists how to make good deductions. 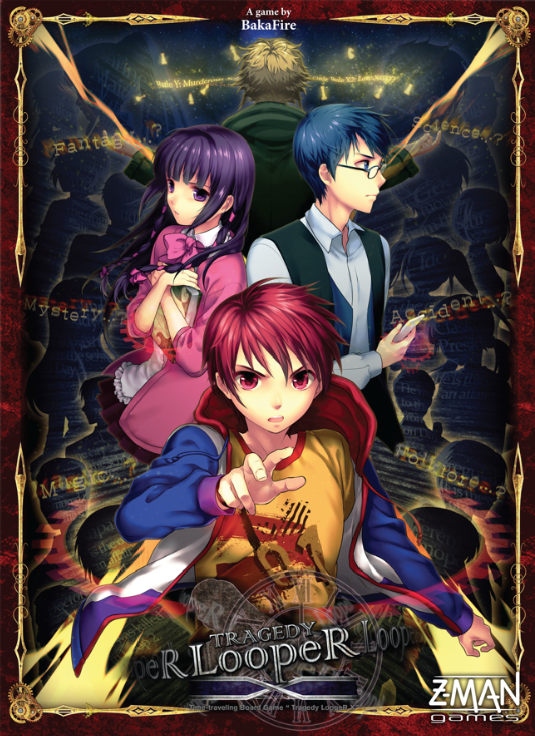 Jonathan F.: I really enjoyed Tragedy Looper. I have played as both mastermind and player, but have not played more than the first two scenarios because I don’t yet own the game. Looking forward to more plays. I like the drama of the card play, but don’t take anything other than the deduction superseriously. 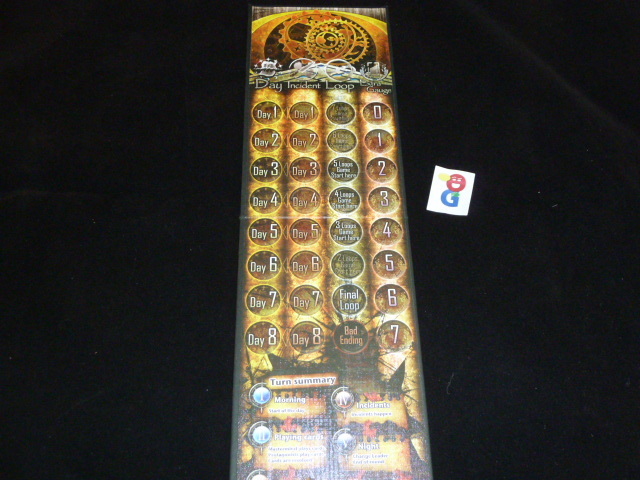 Michael W.: I’ve played 3 times – once as Mastermind – and really enjoyed it each time. As Dale says, it’s a great game for a group to explore together, working their way through the scenarios. Wish I had that kind of opportunity to see what surprises the non-entry-level scenarios hold. I love it! 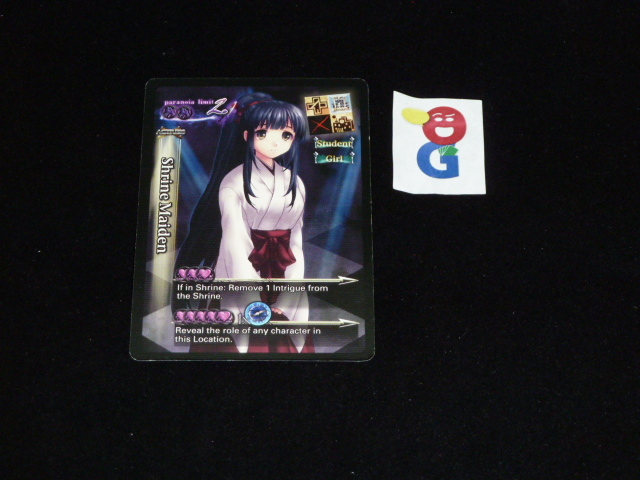 Dale Y, Wei-Hwa, Jonathan F., Michael W.
This entry was posted in Essen 2014, Reviews. Bookmark the permalink.